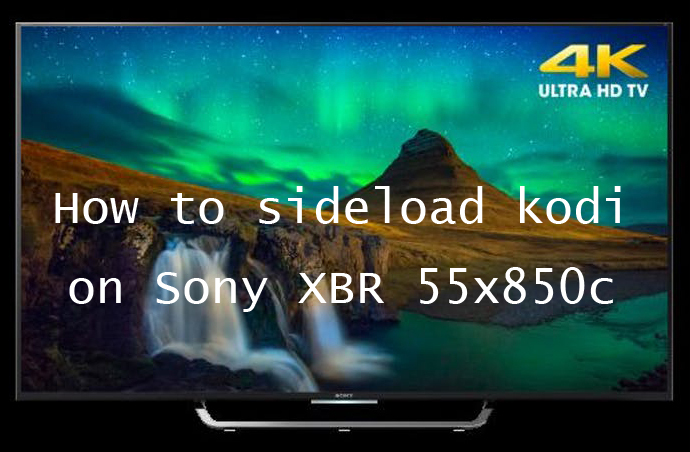 I recently became the owner of a new Sony XBR-55X850C. I have to say, the picture quality in 4K is absolutely awesome If you can find content. Before purchasing the TV, I did some research and found that there were quite a few problems with app availability, and several customers felt that the firmware would barely qualify as a beta. I brought my concerns to Best Buy, and the employees insured me that there has been an update this past week that fixed most of the issues. So I grabbed one and brought it home. First impressions were awesome, the TV is very slim, light, and fit the mount I already had. After hooking up the TV, the first thing I wanted to see was some 4K footage. Kodi team doesn’t provide any direct way of installing their app on PS4, but you can sideload the Kodi on PS4. I found some on the YouTube app, which was really nice, but I can only stand so much nature footage. Next, I tried Netflix, as there is supposed to be some 4K content there, keep in mind the Netflix app had been missing entirely before the last update. Since there is no way of identifying 4K content on Netflix, I simply searched “4K” and looked at what was returned. I don’t think everything returned is 4K content. I would expect to see a “4K” or “UHD” logo in the area where the HD logos etc. are presented, but there is not one. Streaming content from Netflix is very disappointing, it seems there is still some software issues, as I can only watch a few minutes of a movie before being dumped to a buffering screen that usually sticks at 25%. Next, I thought I would try Hulu, WRONG! There is no Hulu app yet, supposed to be released soon. I understand 4K is still in its infancy, but, had I bought a Samsung, I would have had access to 4K on all of these services without issue. All in all, really disappointed with this portion of the TV for right now, I’m hoping the coming updates address all the issues. I wanted to see what I could do to get Kodi on Sony XBR-55X850C working, I’ve always liked XBMC, but haven’t run it in several years. I switched from Android to iOS phones a couple years back, so I had been out of the Android scene for a while. To my surprise, the method I needed to use to get it installed and working was one I was already familiar with. On your TV’s touchpad remote, press HOME. Navigate to and click on SETTINGS, it’s all the way at the bottom. Navigate to the TV section, scroll to and click on ABOUT. Press BACK on your remote. Go to PERSONAL>SECURITY & RESTRICTIONS, and turn Unknown Sources ON. Hit the HOME button on your remote and navigate to the Google Play Store. Copy it to a USB drive, and insert the drive into your TV. You will be able to see a “USB Connected” prompt on the TV. Inside of ES File Explorer, on the left panel, scroll down >> LOCAL column, there will be a device called USB****(last numbers vary). Click on USB****, then click OPEN, grant access by saying OK, then click on your downloaded Kodi APK and install it. That’s it! Press HOME on your remote and Kodi should be available and run without any problems!